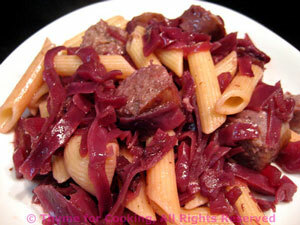 Pasta with Red Cabbage, Smoked Sausage, Thyme for Cooking easy gourmet. The slightly salty, sweet flavor of smoked sausage goes well with the sweet sour taste of the cabbage. The pasta just brings it all together. I used smoked bratwurst. Italian sausages would work... but something smoked is better! Heat a large nonstick skillet over medium-high heat. Add sausages and brown well. Add cabbage, reduce heat, cover and simmer until sausages are done and cabbage is hot. When done, remove sausages and slice into 1" (2.5cm) pieces. When pasta is done drain and put into a big bowl. Add cabbage and sausage, toss to mix well and serve.